Founder, Ten3 Business e-Coach – Inspiration and Innovation Unlimited! 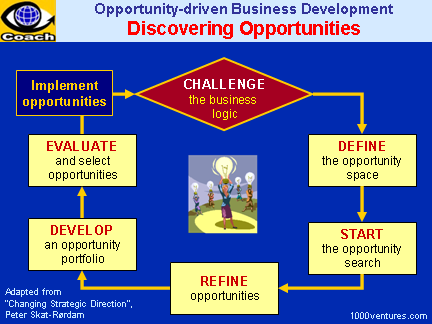 Opportunity discovery is at the heart of the opportunity approach to business development. This needs to be a natural element in your company's range of activities. Changing your perspective is the key to finding success in seeming failure. "Optimistic thinking has sometimes gotten a bad rap as being unrealistic, but research has found that we can indeed live happier, healthier, and more successful lives if we can learn to discover opportunities in problems. "3 Due to optimistic positive thinking, problems will become merely challenging opportunities that you can turn to your advantage. They provide opportunities for personal growth and can stimulate your creativity for finding better ways to live. Experimentation means trying something new and unproven – and acknowledging that you cannot reliably predict the outcome. A major American enterprise with a diverse group of huge businesses, GE is steeped in a learning culture and it is this fact that makes GE a unique company. As Jack Welch puts it: "What sets GE apart is a culture that uses diversity as a limitless source of learning opportunities, a storehouse of ideas whose breadth and richness is unmatched in world business. At the heart of this culture is an understanding that an organization's ability to learn, and translate that learning into action rapidly, is the ultimate competitive business advantage." Sometimes in the middle of the problem-solving process, opportunities arise to get an easy win, to make immediate improvements, even before the overall problem has been solved. Case in Point Dell Inc.
"Our success is due, in part, to not just an ability but a willingness to look at things differently," writes Michael Dell3, the Founder of Dell Inc. "I believe opportunity is part instinct and part immersion – in an industry, a subject, or an area of expertise. Dell is proof that people can learn to reorganize and take advantage of opportunities that others are convinced don't exist. You don't have to be a genius, or a visionary, or even a college graduate to think unconventionally. You just need a framework and a dream." It's precisely this observation-fueled insight that makes innovation possible. There'll always be serendipity involved in discovery.